See the previous or best lap? — Welcome to the GameSalad forum! I wanna make a kind of race game and how can i do that: see my best or previous lap. I new here so please write the solution step by step. its a big job your asking for.... no ones going to give you a step by step walkthrough. I'd work on getting the basic racing game together first, then work on the best lap/replay stuff once you've got the racing part sorted. If your having trouble figuring things out, theres a couple of good racing templates over on GSHelper that are worth looking at, DeepBlueApps did a couple of good ones, also Pinkio has one too. But yup, a working racing game, with lap playback, which is what I think your asking for, isn't a small project, and not something that your going to get a step by step solution to here on the forums. You'll need to work on it, and then break down any issues into smaller parts that you can then put to the forum, to see if people can help out on more specific problems. I think you should understand the logic of GS first and how things work, then think about making your game (Even if you find a template or a step by step solution). 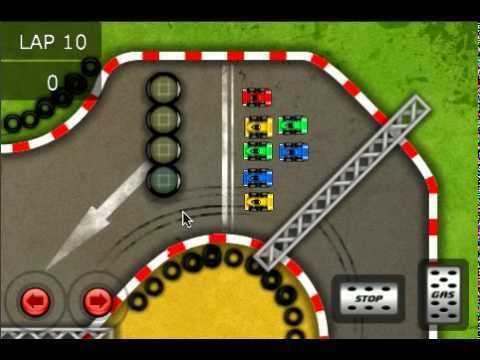 If you add something later on to the game and it causes bugs , you have to know your code to be able to fix it.Since your new, I'd recommend you start by watching GS logic series on youtube and watch several tutorials try making simple game demos then when you get the hang of it you will be able to make your racing game. I think the original poster is asking how to show the best lap not make the race game in full. If that's the case then you just need to store the best time for the lap in an attribute and at the end of each lap check the current lap time against that attribute and if the time is better overwrite the attribute. Check this rule everytime the car crosses the lap line. You can then show the game.bestLapTime anywhere you want in the game. These attributes will need to be set up as reals. Nope see bold text, he wants to know how to make the game and how to do the lap times. No one is going to build a game for you. The idea here is to learn how to make games. It will take a few months to learn the software well enough to make that type of game. watch tutorials, try making some simpler games first. Go to http://learn.gamesalad.com and try a few of the create a simple game follow alongs first. Sent you a pm with a link to our GS Racerz template if it helps.